Enthusiasm for Donald Trump’s candidacy has fallen. 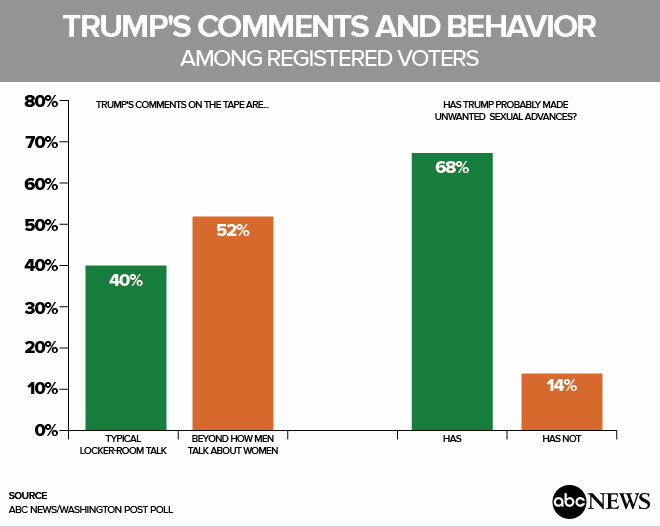 Enthusiasm for Donald Trump’s candidacy has fallen, two-thirds of registered voters reject his claim not to have made unwanted sexual advances toward women and Hillary Clinton’s support has firmed in the latest ABC News/Washington Post poll. Yet the race between them remains close, a testament to the strong pull of partisan preferences. The contest stands at 47-43 percent, Clinton-Trump, among likely voters, with 5 percent support for Gary Johnson and 2 percent for the Green Party’s Jill Stein if the election were today. 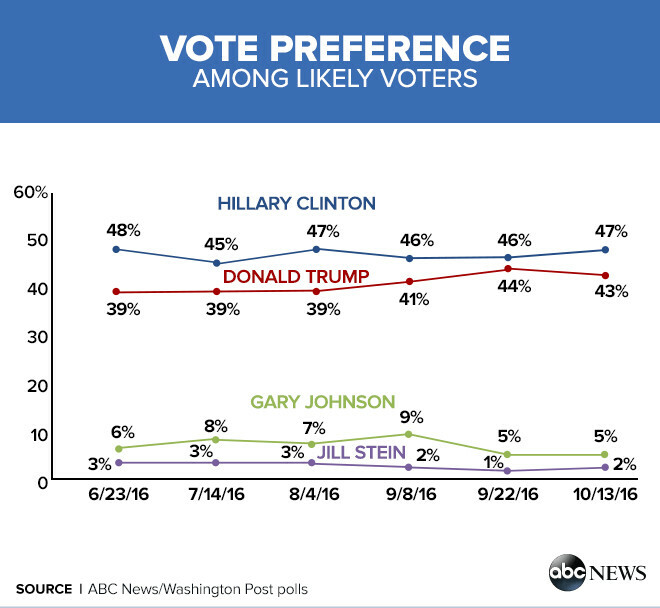 That’s little changed from 46-44 percent in the last ABC/Post poll, conducted just ahead of the first debate and before the firestorm of controversy that’s erupted over Trump’s treatment of women. • Enthusiasm for Trump among his supporters has subsided from 91 percent last month to 79 percent now, erasing his advantage over Clinton on this measure. • Conversely, the share of Clinton supporters who say they might change their minds has dropped from 16 to 9 percent. Eighty-nine percent say they’re definitely for her, up 6 points. • Only 30 percent of registered voters say Trump has “strong moral character,” down 6 points from a Gallup poll (among all adults) last spring. Clinton does 15 percentage points better on this score, and her rating for moral character is up 6 points. • Views of Trump as honest and trustworthy have lost 8 points, dropping back from 42 percent of registered voters -- a high for Trump -- to 34 percent now. That eliminates the 9-point advantage on this key attribute he held over Clinton last month. • Just 34 percent say Trump has the personality and temperament it takes to serve effectively as president, flattening after peaking last month. Far more -- 59 percent -- rate Clinton positively on this measure. The poll, produced for ABC News by Langer Research Associates, also finds that Clinton holds a continued lead on perhaps the most basic gauge, being qualified for office. Fifty-nine percent of registered voters see her as qualified vs. 39 percent who say the same about Trump. In another overall assessment, among all Americans, 66 percent now see Trump unfavorably, up 7 points from before the first debate and 13 points more than the number who see Clinton unfavorably. (Fifty-four percent see Trump “strongly” unfavorably, 2 points from its peak in June.) That said, the gap tightens among registered voters; 63 percent see Trump unfavorably and 57 percent say the same about Clinton. Indeed, 24 percent see both unfavorably -- a group in which support for Johnson and Stein peaks. Given their unpopularity -- the highest for major-party candidates in ABC/Post polling dating back 32 years -- enthusiasm for both candidates is substantially lower than the norm in past elections. Two-thirds of registered voters say their preference is not affected by the release of an 11-year-old videotape in which Trump crudely described his sexual advances toward women. The one-third who say it makes them less apt to support him fit the profile of those who were unlikely to do so in the first place. At the same time, well fewer than half, 40 percent, accept Trump’s suggestion that he engaged in typical locker-room talk; 52 percent say he went beyond that (men and women alike). Just 38 percent think his apology for those comments is sincere. And 68 percent think Trump probably has made unwanted sexual advances toward women, which he’s denied. 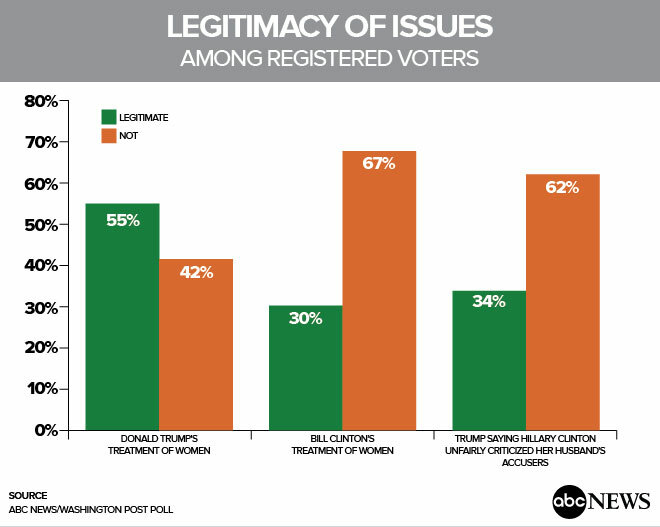 Pushback on the issue looks to be a challenge for Trump; 55 percent of registered voters say his treatment of women is a legitimate issue in the campaign. Far fewer are attuned to his counterattack: Just 30 percent say Bill Clinton’s treatment of women is a legitimate issue, and 34 percent say the same about Hillary Clinton’s response to her husband’s accusers. On other matters, 57 percent say it was inappropriate in the second debate for Trump to suggest that if he were in charge of the law Clinton would be jailed for her use of a private email server while secretary of state. And Clinton is seen as having won that debate, by 45-32 percent -- albeit much less than her margin in the first debate, 51-21 percent. Given Clinton’s advantages, a central question is why overall vote preferences are close. One answer is a lack of differentiation between the candidates on key issues: They’re rated evenly in trust to handle the economy, terrorism and immigration alike. Clinton leads on others -- by 8 points in trust to handle ethics in government, 14 points in trust to look out for the middle class, 16 points in trust to handle an international crisis and by a wide 47 points in trust to handle women’s rights. These, though, are less impactful on vote choices. The bottom line is the very strong influence of partisanship. Among Democratic likely voters, 89 percent back Clinton; among Republicans, 86 percent are with Trump. Independents -- sometimes but not always swing voters -- currently divide by 45-37 percent, Clinton-Trump, with 12 percent for Johnson. Trump is strong in the GOP base even though only about half of Republicans and GOP-leaning independents who are registered to vote, 49 percent, think his views reflect the core values of the Republican Party. But that’s no worse than it was in May. And among leaned Republican likely voters, 67 percent who don’t think he represents the party’s core values support him anyway, presumably because they feel he comes closer than Clinton. Clinton leads by 8 points among women, while she and Trump run evenly among men -- an unexpected change from late September, when Clinton led by 19 points among women, Trump by 19 among men. This reflects greater support for Trump among white women who lack a college degree, partly countered by gains for Clinton among white men. Similarly, 56 percent of non-college-educated white women agree with Trump that his videotaped comments represent typical locker-room banter. So do 50 percent of non-college white men. Among college-educated whites, that falls to barely more than a third. There’s little or no change among other groups. Clinton’s supported by 86 percent of blacks and 62 percent of Hispanics. White Catholics -- a swing voter group from 1976 to 2004, but not since -- side with Trump by 51-38 percent. Evangelical white Protestants, a strongly Republican group, remain so; sexual misconduct questions aside, 75 percent back Trump. Clinton’s winning 84 percent of Democrats and Democratic-leaning independents who preferred Sanders for the nomination. Trump does less well among leaned Republicans who wanted someone else as the nominee; 74 percent of them line up behind him. But this gap is mitigated by the fact that former Sanders supporters are less likely to say they’re sure to vote. 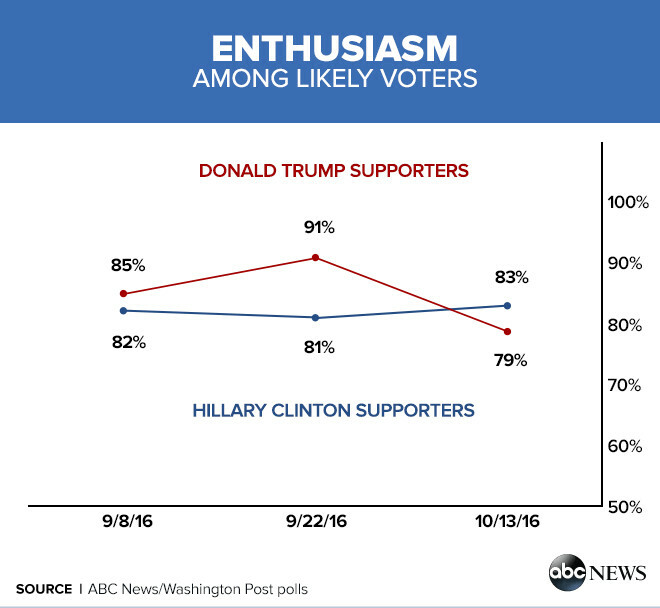 As noted, the number of Trump supporters who say they’re enthusiastic about their candidate has dropped from 91 to 79 percent; Clinton’s enthusiastic support is essentially unchanged, at 83 percent. This shows, as well, in the share who are “very” enthusiastic about their candidate -- 47 percent in Trump’s case, down from 55 percent; and 43 percent in Clinton’s, again essentially unchanged. Trump had a 12-point lead in strong enthusiasm in early September and 9 points in late September; it’s down to a non-significant 4-point gap now. Neither candidate has high levels of enthusiasm compared with past elections. Enthusiasm among Barack Obama’s supporters in mid-October 2012 and 2008, and John Kerry’s in 2004, was 11 to 13 points higher than it is for Clinton today. On the GOP side, enthusiasm was 14 points higher among Mitt Romney’s supporters, 8 points higher among John McCain’s and 14 points higher among George W. Bush’s than it is for Trump now. There’s also the question of movability -- the extent to which likely voters may yet change their minds. There’s not a lot of room for Clinton or Trump supporters to shift; 89 percent of her backers (+6 points from late September) and 88 percent of his say their minds are made up. What movability exists is among those who support Johnson or Stein: In this group, 54 percent say they might yet change their minds. Higher movability among the third-party candidates’ supporters is similar to what it was in 2000, with Ralph Nader and Pat Buchanan in the race. Less movability in the major party candidates’ support, for its part, is typical for elections since 2004. (There was somewhat more movability in 1988-2000). This is a reason campaigns are not only about persuasion, but about motivating one’s existing supporters to turn out -- or one’s opponents’ to sit it out. This ABC News/Washington Post poll was conducted by landline and cellular telephone Oct. 10-13, 2016, in English and Spanish, among a random national sample of 1,152 adults, including 920 registered voters and 740 likely voters. Results have a margin of sampling error of 3 points, including the design effect, for the full sample, and 3.5 and 4 points for registered and likely voters, respectively. Partisan divisions are 33-25-33 percent, Democrats-Republicans-independents, in the full sample, 32-29-33 among registered voters and 33-31-31 among likely voters.